An interesting 5 weeks, first in Portugal, back home, next in Majorca, then back home & off the bike for 2 weeks coughing, then back riding, including a demo bike. 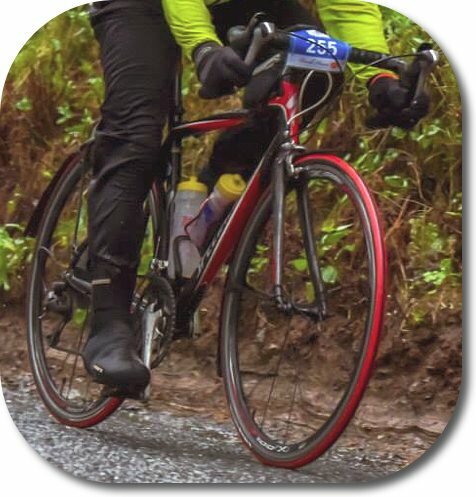 My own bike is a Specialised Roubaix Compact, heavier by modern standards, but I got it on ebay and it is so comfy with it’s built in micro suspension, especially on the rough roads we have round here. I ride it summer and winter and it has gone through several reincarnations in the last few years. 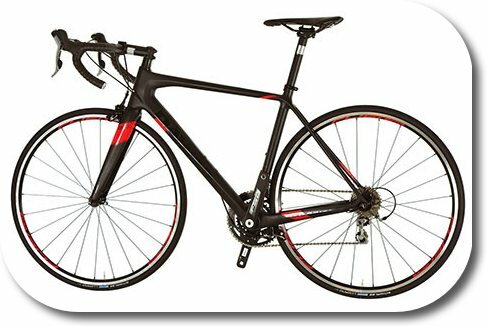 I could get a lighter bike, but not being in the first flush of youth I feel it would make little difference to my performance. As if to reinforce this view I have been lucky enough to get away a bit recently. Rather than the faff & worry of taking my bike away, for just a wee bit more than the cost of to fly it over I have hired bikes. When I got back the bottom bracket had gone on my own bike, so Colin at Belhaven Bikes at Dunbar lent me a demo to try out. None of these were super high spec, but it was interesting to try them out. 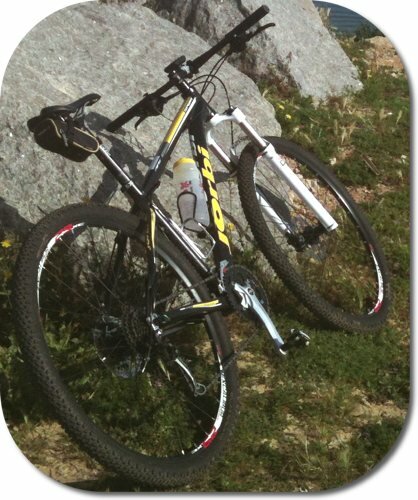 Portugal: a Jorbi 29er MTB for 4 days. I really liked this, it was quick, responsive and several steps up from my old alloy cheapo MTB – great fun. The tyres rolled really well, the wee lever to click off the suspension for climbing worked well and it was fun blasting down loose gravel tracks. Only downsides were the clunky feeling gears, but I suppose that might mean they last longer or are more sturdy, also the handlebars made me ache after an hour or so in the saddle, but I get this on my own as well. This may be the width of the bars? The bike had only been out once and was immaculate. 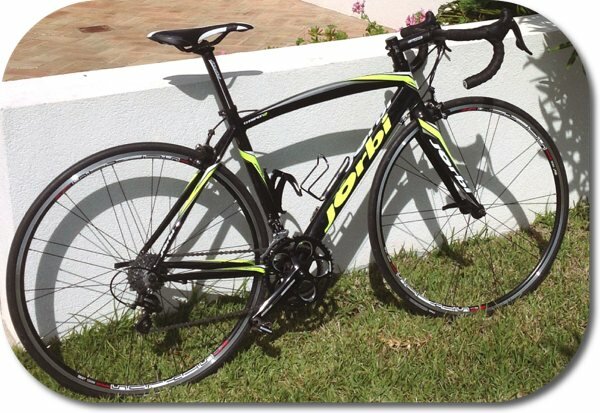 Portugal: a brand new Jorbi road bike which was light, responsive with internal cabling. The gears were Campags, which I found clunky and awkward, I think I’m just to used too my Shimano. 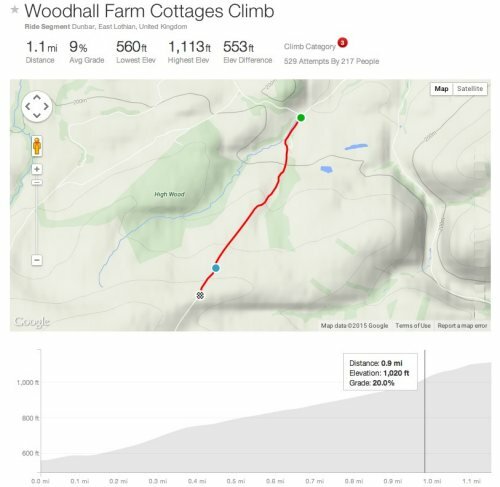 I found the high ratios a bit of a trial on the steeper sections, but it was great on the curvy downhills. The saddle was not to my posterior’s liking either. Both bikes were from Tomás Swift Metcalfe of https://www.swiftmomentumsports.com/, he’s a pro rider and was great apart from a wee blip at the start. Full of good tales, advice and with superb bikes. 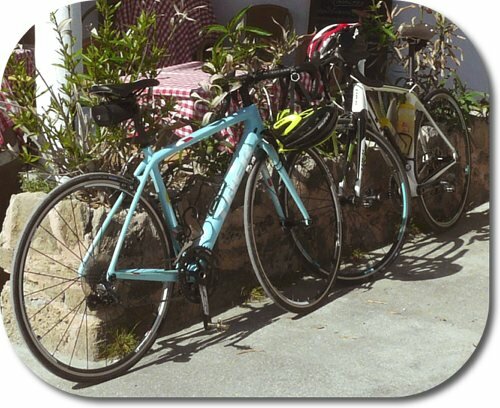 Next hire was in Majorca. This time a Trek Madonne III. I took my own saddle (a Brookes Cambian C17) this time! It was a nice bike but sort of flopped into corners which I found disconcerting at first, but once I got used to it I found it cornered very well. Most of the roads in Majorca are nothing short of superb, but on some of the rougher back roads I found the vibration a bit hard. I had asked them to put on an 11-32 cassette which helped on the longer climbs, but meant the gear change was maybe not as smooth as normal. Overall a good bike for the week. Last bike was the Dawes Giro Alto Demo bike from Colin. I thought this was the nicest of the alternatives. Not hugely high spec, but a good spec, reasonably light and very stiff. Cornering and downhill was fabby, but on the rougher roads round here there was too much vibration for me, but I think I’m spoilt. Then back on my own bike – bliss!!! Okay, it’s not as light, it’s a bit battered. I probably carry too much but it’s comfortable, predictable and I just love it. The 11-34 cassette really helps round here as well! So – Hills – bgddyjim had an interesting post on hills recently. I enjoy climbing hills. I love the physicality of pushing yourself, the tactics for arriving at the top in some sort of reasonable shape and the variety. The south of Scotland is not renowned for hills but we have some real challenges round here. The hills to the south rear up a steep escarpment so getting on up is always a challenge, especially if the wind is blowing a hooley into your face. So I thought I’d look at a few. Kippielaw, just outside our village, only (?) 10% and short but gets my heart and lungs going every time. 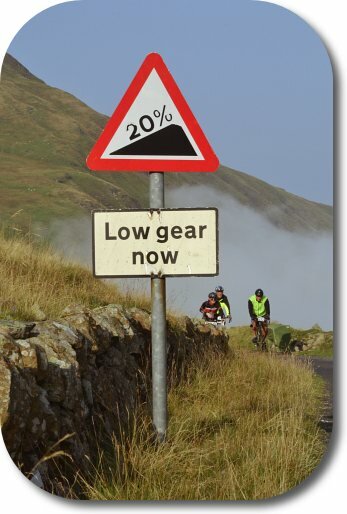 With the steep bit at just under 13% maybe I try too hard? 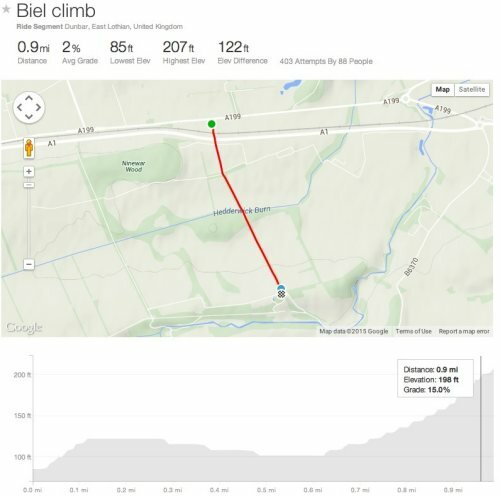 Biel Climb, again close by, not steep except for the deceptive looking last bit – that 15% feels like it! 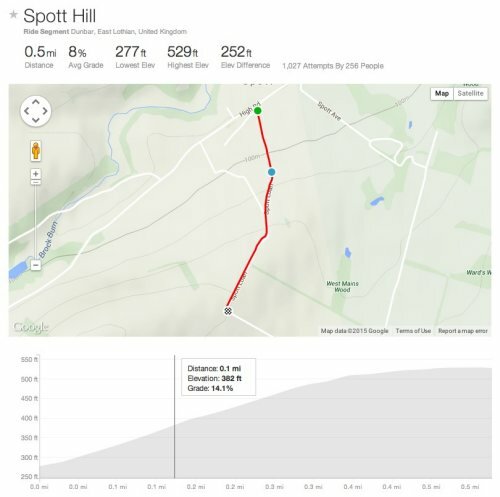 Spott Hill, known locally as Starvation Brae, this ramps up to just over 14%, relents for a moment & then hits you again – a local classic. 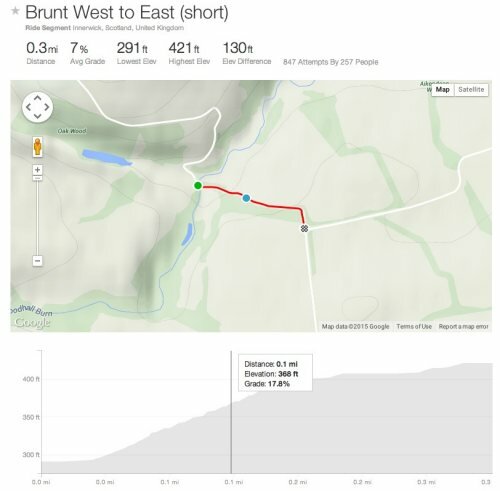 Brunt west to east, another short sharp climb, with a few steep ramps, one over 17% Woodhall Farm Cottages Climb – a real test piece of the district, starts off at 15%+ steadily climbs at 6-9% before hitting you with a 20% rise. Bad enough normally, but with a good westerly wind – more than interesting. 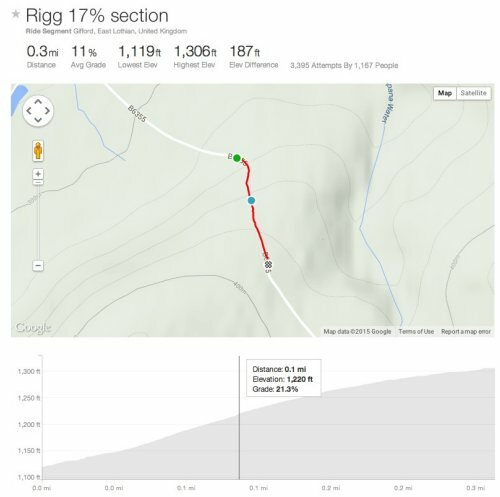 And finally Redstone Rigg – Rigg 17% section “Going up the Rigg” is a favourite expression for locals, just a short climb at 11% (part of a larger ascent), but Strava reckons it is 22%+ at it’s steepest. I just know it has me puffin’ and the legs know they’re there. So just a few delights of our part of ‘Lowland’ Scotland. Now for the ‘dangerous’ bit: a great talk on TED: http://www.ted.com/talks/gever_tulley_on_5_dangerous_things_for_kids#t-539486, only thing I disagree with shouldn’t the cars be bikes? 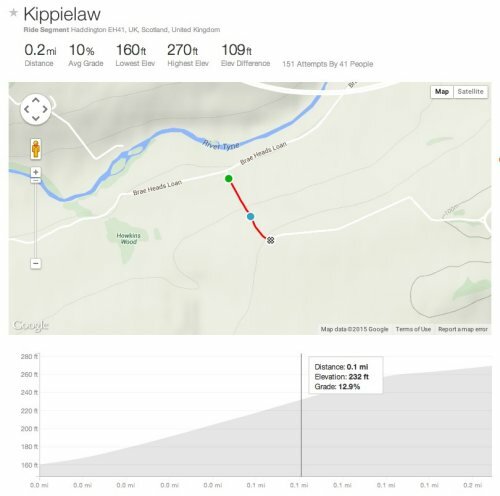 This entry was posted in age, bike, Dawes, East Lothian, gears, hills, Jorbi, long ride, Scotland, Specialized, steep, Trek and tagged bicycle, bike, dangerous, East Lothian, gears, hills, jorbi, Scotland, Specialised, steep, Trek on May 31, 2015 by fossilcyclist.